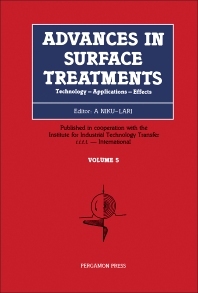 Advances in Surface Treatments provides information on technologies, applications, and effects of surface treatment processes on different materials. The text is composed of papers that are presented at the AST World Conference, ""Advances in Surface Treatments and Surface Finishing"", held in Paris in December 1986. The book is divided into six parts; each of which discusses a different topic in the field of surface treatment. These topics include thermal and thermochemical surface treatments; mechanical surface treatments and their effects; quality control of surface treated materials; surface finishing; surface coating; laser surface of hardening materials; and the relationship of surface treatment with the environment. Topics such as metallic coatings and special surface treatments are also covered in the book. The text is recommended for engineers who are not yet familiar with surface treatments as well as those who wish to contribute to the research in this field.